For those teams with international partners, how is the application used in their countries? Are their unique features of the application that may be more relevant to those outside of the US? How could the application be used within an educational situation? How does it work? Briefly, what does one have to do to start using it? How is it related to other applications, can it be used in conjunction with other applications? What are some unique ways of using wordpress.org? What is the purpose of Wordpress.org? What is the true title of the application? Who developed it? How Wordpress.org relates to other applications? First of all, let's have a look at what Wordpress.org is. As the creators put it, "Wordpress.org is a state-of-the-art publishing platform with a focus on aesthetics, web standards, and usability. Wordpress.org is both free and priceless at the same time. Simply put, Wordpress.org is what you use when you want to work with your blogging software, not fight it." Wordpress.org is a great tool for web users who are interested in creating their own web pages but who lack the technical knowledge that was necessary in the past.People who have Wordpress.org "blogs" can easily post updates about anything from their personal lives, their business, and a limitless number of other possibilities. The creators of Wordpress.org wanted to make a website that is easy to use and effective at the same time. Usually the site is used for blogs and help with creating websites, but there are other uses. More educational uses of Wordpress.org can be seen in the, "How could the application be used within an educational situation," section of this chapter. The easy accessibility allows students from anywhere in the world with web access to use the site and receive feedback on a blog or other writing of any kind. Wordpress is an open source project and in the creator's words from the about page:" it also means you are free to use it for anything from your family home page to a major business web site without paying anyone a license fee. This means Wordpress is completely, totally, and utterly free. Not only is it free, but you also can make money off of your site by letting companies place their advertisements on your page!" Simply put, Wordpress.org is a blog that works by creating a place for people all over the world to share information. 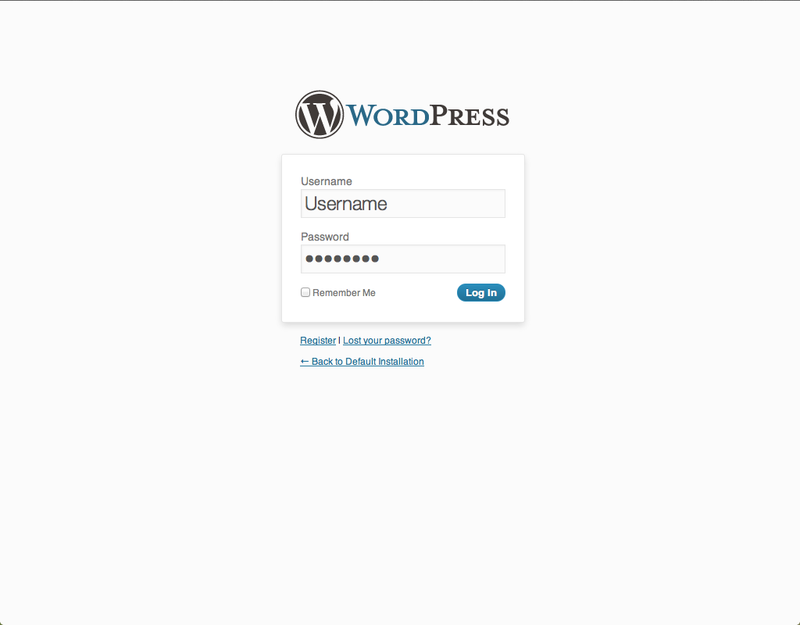 To start using Wordpress.org one can easily install it by going to the website and downloading it. ">To start using Wordpress.org one can easily install it by going to the website and downloading it. Wordpress.org is a very intuitive content management system that makes updating web pages very easy. WordPress.org is a CMS or Content Management System. "Content management system (CMS) is a computer application used to create, edit, manage, search and publish various kinds of digital media and electronic text." Other CMS applications include Joomla, Drupal, and Textpattern. Content management and publishing are the main uses for these systems.2 Rather than coding and posting entries directly through the website, patrons use it to add new updates and pages, along with an assigned theme on the page to enhance the experience of your viewers, Wordpress.org seamlessly updates it's site for the user. Wordpress.org also automatically indexes all of the posts on the site and makes searching for them much easier with it's easy to use "tag" interface. II.Howisitrelatedtootherapplications,canitbeusedinconjunctionwithotherapplications?">II. How is it related to other applications, can it be used in conjunction with other applications? Users can easily import text from b2, Blogger, Greymatter, Movable Type, and Textpattern. There is a very long list of applications that can be used in conjunction with Wordpress.org. Users are supported by Ping-O-Matic which gives the maximum exposure for blogs to search engines. Users own the domain name, no need to worry about losing your readers! This way there isn't a limit on the people that view your blog. It can be more widely spread. 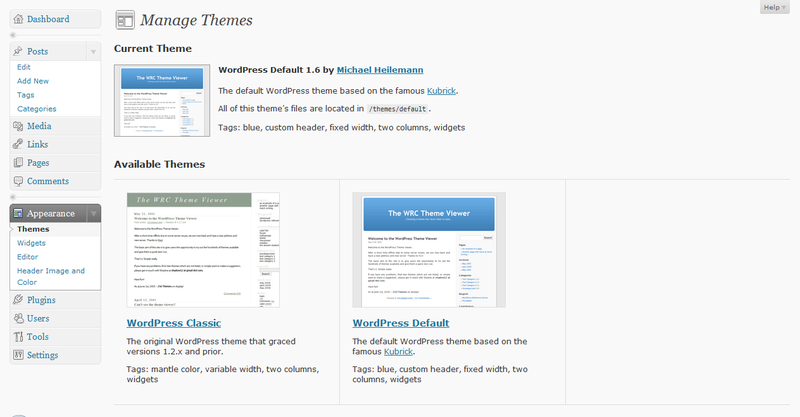 Example of how to change the theme of your wordpress.org page !presentthemes2_7.JPG! Wordpress.org is an extremely diverse content management system capable of taking on a vast number of different looks, depending on what the user wishes to do with it. There is a large community of people on the internet that develop themes for Wordpress.org, and these themes can take on many different looks - whether you're just starting your personal blog or if you're a large newspaper company looking to put your content online there is a Wordpress.org theme for you. 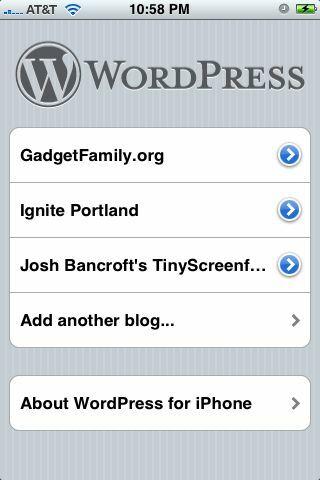 On Wordpress.org you can have multiple blogs that can be managed by one server. Wordpress.org has an integrated blacklist and an open proxy checker. The purpose of these things is to eliminate comment spam that may come up on your blog. Wordpress.org is often used as a launching site for other websites. Wordpress.org can be used to keep people updated on upcoming events, collaborating on various projects, or even as a way of having ongoing discussions with friends about topics of interests. How can Wordpress.org be used in different grade levels? Peer Editing, Students could upload their papers to the site and then have a partner assigned to them that has to edit their paper and then repost it, for not being in an actual classroom it gives fairly quick feedback to students. Because Wordpress.org is "completely customizable and can be used for almost anything", teaching students how to use Wordpress.org should be fairly easy. In return, educators have a great blogging website for students to use for online discussions. Wordpress.org can also be used in business and industry. With this blogging software you can open a blog up to an idea and others in that business or industry can comment on and make slight adjustments. Also, a lot of business is done internationally and with Wordpress.org, businesses can interact with others from different nation and they can share their thoughts.By using a peer editing system through Wordpress, it would give the teacher a much needed break from reading 20+ papers and making his or her own comments and corrections on the initial draft. Collaborating on projects gives students more ideas because instead of just one teacher reading the paper, multiple students would be able to give their own suggestions. After this step the teacher could then make revisions of the corrections off of what the peer editing suggested. After making their own Flat Stanley and sending them to places all over the country, students will learn about places far away as well as learn about where states are on a map. Post poems online to wordpress.org. Students will select one book from the independent reading list and create a biographical sketch about the author, a character synopsis and relate it to pop culture, sitting ways this particular story has been influential in other artistic works (paintings, plays, movies, musicals, poems, other books) They will be asked to blog about different aspects of the book and the way it compares to the work that was influenced by it. Using a blog they will be able to see other blogs by students in their class. Students will also be able to comment on other blogs. Students will be able to clearly articulate how classical works have influenced modern popular culture works, they will be able to compare and contrast stylistic, as well as methodical differences within the works. • This lesson explores the implications of developing a musical from a literary text or an historical event, and includes suggestions for immersing students into the creative process of building a musical. • gain insight into ways a musical can be unified into a cohesive production. • recognize the potential of literary sources and/or historical events as inspiration for musicals. • recognize aspects of the identification between themes and forms of musicals and the cultural climate of a time period. • exercise collaborative problem-solving techniques. • broaden research experience in diverse media. • strengthen process skills of reading, writing, explicating. This plan is to be implemented for new employees to a business in which they know very few to no people. The best part of this plan is that it does not necessarily require a face-to-face contact. In a world where international businesses are more and more common, the ability to meet virtually is priceless. Discuss relevant material pertaining to the business. Create web pages using said Wordpress.org account. Teachers could use Wordpress.org to collaborate with other teachers in blogging and even start their own website. Their students will be able to use the website as an educational guide or reference. Teachers and students will be able to facilitate a network. Teachers will be able to learn more about technology. Teachers will be able to properly maintain and adjust a website. The link below will take you to a Wordpress.org website that a future teacher has posted physical education lesson plans and is looking for feedback from peers or other teachers. Using Wordpress.org to develop a teaching website allows other teachers to make suggestions and comments on the lessons. It also allows the students to give feedback to the teacher on where they could improve the lesson. All of these famous companies use wordpress.org to run their websites or just use wordpress.org as their blog. Some unique features of the application are that it can be used in any language. Also, because the application is "open source", people from all over the world have access to it and can work on it at any time. Wordpress.org has great tools that can be useful around the globe. One useful thing about Wordpress.org is the ability to build online portfolios and post resumes. This is very helpful for someone who is trying to get a job in another country. Employers can view the resume online and easily access a candidate's portfolio of past work. This saves both the employer and the applicant time and money. 1Although the majority of Wordpress.org users come from the United States, it has also become widely popular in Europe and Asia. For example in France and South Africa they use the application the same way many of us in the United States use it. In these countries there are many newspapers that use it as an online newspaper, many of them had previously used other blogs but because of how easy Wordpress.org is they decided to switch. Anyone in the world can look for job postings on Wordpress.org even if the job is inside or outside the United States. Some blogs or other postings are made concerning the job markets which allow readers to find ways to contact the employer without leaving their own home. The process of localizing a program has two steps. The first step is when the program's developers provide a mechanism and method for the eventual translation of the program and its interface to suit local preferences and languages for users worldwide. WordPress developers have done this, so in theory, WordPress can be used in any language. The second step is the actual localization, the process by which the text on the page and other settings are translated and adapted to another language and culture, using the framework prescribed by the developers of the software. WordPress has already been localized into many other languages (see WordPress in Your Language for more information). This article explains how translators (bi- or multi-lingual WordPress users) can go about localizing WordPress to more languages. Hi everyone! I am the Project Manager for this semesters Group 1 Wordpress.org wiki chapter. I am really looking forward to working with all of you. I am a sophmore in Engineering/ Technology Teacher Education here at Purdue. I have a focus in Computer Graphics for Manufacturing. I enjoy out many outdoor activities in the mountians such as skiing, fishing, horseback riding, and mountain climbing. I am from Fairplay or "South Park" , Colorado.... true story. If you have any questions please feel free to make a comment here and I will do what I can to help. Hello! Iam Han yafei from Beijing Normal University.I am here to sign in.And I am looking forward to working with you! the Basic Theory of Educational Technology,Teacher Training and School-based Research. I have a wide range of interests and hobbies .Such as Yoga,Pilates,Belly dance,etc.And I love travelling around,climbing mountains(I have the same hobby with Rachel Renae Taylor )and sightseeing.I am looking forward to working with all of you too.My email adresss is :yafeihaneven@gmail.com.My MSN address is :yafeihaneven@gmail.com. Hey everyone! Please read this! I have compiled all of the information from the child pages to the bottom child page Wordpress.org Reseach Compilation. If you can all start editing the information on that page instead of the child pages that would be great. I think the child pages are going to get deleted soon anyway. Hi everyone, I think we can start to delete the names off of each "fact" so that it can start to look like a more cohesive page.